Bob Larson remembers Midtown back in the '70s, when he liked to hang out at the Winter Lodge after classes at Walter Hays and Jordan. There was a toy store on California Avenue and Bergmanns was a great all purpose store where TravelSmith and the Territory Ahead are now. 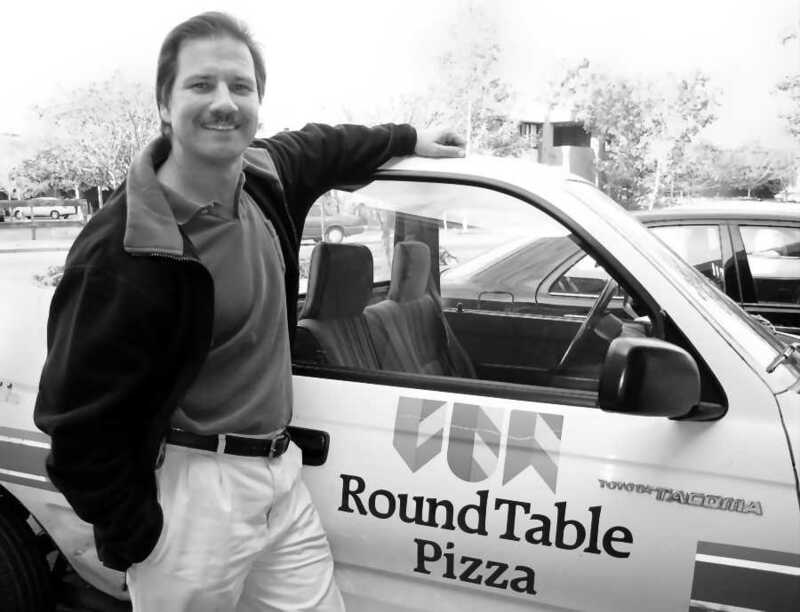 His father, Bill, founded the Round Table Pizza Chain with 25 restaurants in 1959 and sold the chain in 1978. The Colorado store is the second longest running operation in Midtown, after Peninsula Hardware. Like his dad, Bob grew up in Palo Alto (Bill went to Mayfield High) and early on Bob began work at the family's Round Table Pizzas. Before he was a teenager, Bob helped out at the family's Round Table Pizza restaurants at Colorado Avenue, Alma Plaza, and University Avenue. During the summers, he worked from 9 AM till 5 PM, 5 days a week - the only kid on the block bringing home a paycheck! He also was a paperboy for the Palo Alto Times. His sister Linda Overton was his partner until 1997 when he bought her out. Now his own kids have been coming to the restaurant since before they could walk and, with their father owning Round Tables on El Camino in Menlo Park since 1987) and California Avenue (since 1999), as well as the restaurant on Colorado Avenue in Palo Alto (purchased from father Bill in 1987), it is likely that they, too, will enter the family business. Over the years, Bob has seen changes and new trends in the business. New pizza combinations are introduced with starred plaques on the wall and the year of their debut. There has been the rise since the early 1990s of the HMR (home meal replacement) and home delivery. Pizza has long been the food of choice for corporations and start ups alike, Bob notes and companies are a major market segment. Still, the restaurant itself is important and in 2003, BLO Pizza Enterprises spent $100,000 on a facelift at the Colorado Avenue restaurant with paint and new carpeting. The bathrooms were spruced up - brought inside and made ADA compatible. Today computers may keep track of an individual's preferences in pizza, but your place itself has to have a personality. For that, Bob looks for a certain people personality in the Round Table employees he hires. You have to be a mainstay in the community and have a responsibility to that community. Through his three restaurants, Bob supports Habitat for Humanity, Ecumenical Hunger Project, the Jaycees and neighborhood events such as the annual Midtown Ice Cream Social. He coaches his kid's teams in AYSO (American Youth Soccer Organization), pony baseball, y-ball (through YMCA) and CYSA (California Youth Soccer Association). "What you contribute to the community, the community gives back to you," notes Bob.